From slave drivers to stagecoaches next. Filmmaker Quentin Tarantino continues his exploration into westerns with another project called The Hateful Eight, which already had a live read event in April and will be going into production later this year, aiming for release in late 2015. While some early artwork was released along with the script and live read, another promo poster has arrived courtesy of Empire - showing a stagecoach leaving a bloody trail. The cast includes Bruce Dern, Samuel L. Jackson, Michael Madsen, Kurt Russell, James Remar, Amber Tamblyn, Walton Goggins, Zoe Bell. It will be filmed in "Super Cinemascope". This new poster includes the 2015 date listed, which is being reported as confirmation this is due next year, and there's also that little piece of text at the bottom that touts a "limited roadshow engagment." 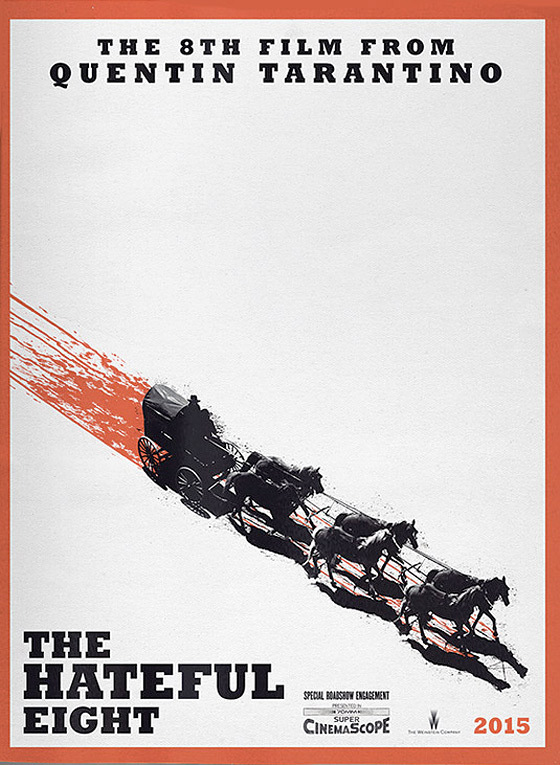 Will we get a nationwide tour screening The Hateful Eight? Hopefully we'll find out more info sometime next year. For those just joining us, the film was revealed to follow the steadily ratcheting tension that develops after a blizzard diverts a stagecoach from its route, and traps a pitiless and mistrustful group in a saloon in the middle of nowhere. The stranded group included a competing pair of bounty hunters (Jackson and Russell), a renegade Confederate soldier (Walton Goggins), and a female prisoner (Amber Tamblyn). The rest of the cast includes Michael Madsen, Bruce Dern and more. You can find more details on the characters in the report from the live-read right here. Stay tuned for more information on the project as it becomes available. That...is a really good cast for a Western. I'm intrigued! I can't wait to see Madsen in another Tarantino film, the guy just exudes smooth badassdom! Another simple, yet effective, poster for another Tarantino masterpiece. I like this poster, especially the red border, which gives it an aura of death, aside from the bloody trail of the wagon. Having said that I do wish that Tarantino would drop the red-black-white color scheme for his movies' promo material. It just seems a lazy design move and makes it look like fan art. Especially for a film enthusiast I'd expected Tarantino to have come up with something better than Django's promo art, so I hope this movie's posters will evolve from the high contrast art with one tired-color scheme.